After a long weekend of binge watching season one with its first ten episodes, the feeling I came away with primarily was, and I quote, ‘Huh?’ I guess I am officially old. Also, since I am old-school, I first read the book he has co-authored, titled Modern Romance which essentially talks about the dating dilemmas of millennials in the era of the smartphone. The book is also from where Ansari draws most of his set-pieces and jokes for Master of None. So if you are really truly interested in how millennials spend their time and deal with their issues, this one is for you. That’s not to say there aren’t some good ideas that Ansari explores here. The most impressive thing that he and his co-writer Alan Yang manage to do is, to take the navel-gazing millennial population and their self (and selfie) obsession and tune into the world at large. They move away from a twenty-something voice-of-my-generation paradigm to a more grappling-with-the-world-and-their-place-in-it observational comedy. The show deals with the idea of ‘emerging adulthood’ and explores how millennials are growing up and engaging not just with their smart phones but also with issues of race, representation, gender differences, older folks, parents, love, romance and relationships all mined for laughs but also for a lot of introspection. Each episode is thematic and sees Dev Shah (Aziz Ansari), the son of Tamilian immigrants (yes, yes I know, more on that later) as a 30-something actor and his diverse coterie of friends: the immature teddy-bear giant Arnold (Eric Wareheim, by far the funniest character on the show), Brian (Kelvin Yu as the son of Taiwanese immigrants), Denise (Lena Waithe playing a lesbian with a lot of game) and his charming girlfriend Rachel (Noel Wells) and other assorted cameos by famous faces such as Busta Rhymes and Claire Danes. Dev’s hipster Brooklyn neighbourhoods feature recognizable haunts that are more true to life than the very white washed New York on Friends. Dev’s New York looks and feels real. It also tackles a lot of different subjects that aren’t mainstream. How many shows question the idea of gender inequality, stereotypical minorities and a love story that grows old fast and asks uncomfortable questions about settling in relationships? While his pilot episode doesn’t really start out strong, you recognize the set-ups and can see the jokes coming a mile away, the show picks up the pace with the second episode which covers the stories of Dev and Brian’s immigrant parents. It gets better with the Rachel-Dev arc as a quirky, well-paired couple and their ups and downs in their relationship. Ansari’s approach to the world is a sort of paralysis in decision making given the abundance of choice whether finding the best tacos or a suitable girl. Steeped with references to a very digital landscape of Google, Uber, Yelp, Tinder and a dating culture dominated by texting, hooking up, and also flaking out, it feels very contemporary. Yet, all that choice just leads you to be a jack of all trades and as the title suggests, master of none. Though conversations with other Indian actors, he defends his stance not to do an “accent”, is uncertain whether to use a racist remark to his advantage and calls out the lack of opportunities for minority actors. There has, however, been a rise of representation of Indians on TV of late : Maulik Pancholy (30 Rock),Asif Mandvi (The Daily Show), Kunal Nayyar (Big Bang Theory), Mindy Kaling (The Mindy Project), and more recently Priyanka Chopra (Quantico) and yes of course, Aziz Ansari. There are more Indians faces in American mainstream media than ever before. Each of them has a well-constructed screen life – a job, romantic partner, parents – a whole character instead of an ethnic joke. Still diversity on the American screen has a long way to go, so there are a lot of things that Aziz Ansari gets right. Still, I wonder, does being authentic and exploring diversity of race and nuance matter only when you are trying to appeal to a white audience? Ansari spends a lot of his time playing down his brown-ness and plays his ethnic card only when it’s convenient. Though as an actor, he chafes at the need for an accent to play an Indian character, he still pushes his ethnicity to get the part. In his book, he breezes past any mention being brown in predominantly white dating pool. Here too, he is shown dating mostly white women. When his girlfriend Rachel, questions him as to why he never told his parents about her, he hides behind that’s not done in our culture argument. For someone who spends his time obsessing about tacos, pastas, ribs and relationships, the only cultural roots he seems to have is to just about to know what pappadums are. Though he had an entire episode dealing with his parents immigrant story, (which succeeded in no small part because of his father) he treats their story as if he had never heard it before. All this feels and plays like a contrived set up rather than a real reflection of a relationship with his parents. That his real-life parents cameo as his fictional parents is adorable with his father (Shoukath Ansari) stealing the show, they win hands down for the most wishful-thinking-fictional-desi-parents ever. Which self-respecting desi parents would do any of the following: not remind you about their rags-to-riches journeys and sacrifices every single day? Console their son that he would get another acting gig instead of hauling his behind back to medical school? Meet his live-in girlfriend and give her a gift instead of lecturing their son and said girlfriend on how he has ruined his family’s honour? Like I said, pure fiction. Clearly, Ansari’s search for authenticity doesn’t apply to Indians. It’s completely acceptable to spend over three hours googling and tracking down the best tacos in town but an choosing the right profile for a South Indian character, nah…let’s just pick a generic Indian name I like and have it stick. 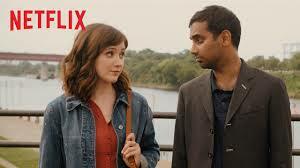 Why else is Aziz Ansari’s semi-autobiographical alter ego, the son of Tamilian immigrant parents, called Dev Shah? You would be very hard pressed to find any Tamilian called Dev Shah. In all likelihood Dev Shah would be a meat-eschewing, vegetarian Gujarati. Ansari stands guilty of painting all Indians with the same brush, with complete disregard for nation of about a billion people with its own regional and linguistic diversity. 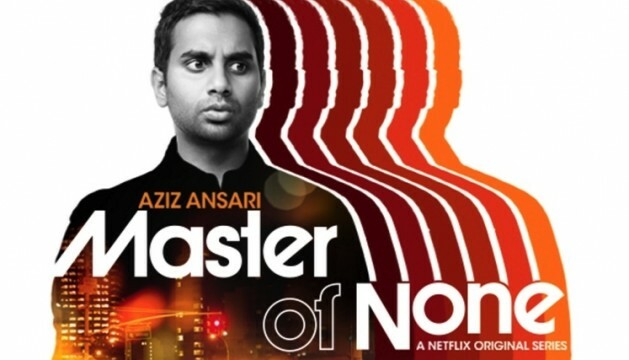 If Ansari was going the semi-autobiographical route any way, why not just play Aziz Ansari, (or insert Muslim name of choice here), son of Tamilian Muslim immigrants? In this time when Muslims are being vilified, attacked and portrayed as the other, such a protagonist would have truly shaken up the dialogue on identity dynamics, not to mention have others come out of the woodwork for that much pork eating! but I guess he is right it is important to be poular before you can be controversial ? I suppose it is important to be popular before you can be controversial. But I don’t think he is trying to be controversial. I think he is trying to say you have to open up TV and media to be more representative of the reality of people from diverse backgrounds. It just irks me that ‘generic’ is OK for desi representation – ie for a desi audience because apparently a DevShah is interchangeable with a Tamilian character and this requires no thought or basic research skills but he has to be 100% authentic about his tacos research.